Scout Report: Who is Aleksandr Golovin? Chelsea's summer transfer window has not started off in the best possible manner. The managerial saga has been dragged on for way too long now and fans just hope to put that behind them and focus on the window before it is too late. However, there are strong reports that Chelsea are interested in CSKA Moscow's Aleksandr Golovin. The 22-year-old midfielder had first grabbed attention from Juventus but the Italian club backed down and Chelsea, with the help of the Russian connections, are now favourites to sign the player. It looks like he will be the Blues' first signing of the summer. Born in 1996, Golovin preferred position is the attacking midfield and currently plays for CSKA since 2012. He joined the Russian club at the age of 16 from Metallurg-Kuzbass Academy. Scouts from across Russia heard about the youngster and many clubs wanted to rope him in but it was CSKA who signed him. He made his senior debut in 2015 against Mordovia Saransk, while his Champions League debut came against Manchester United. In December 2016, he signed a contract extension with CSKA until the end 2020-2021 season. Coming to his international career, the 22-year-old won the U-17 UEFA European Championship in 2013 and also participated in the FIFA U-17 World Cup in the same year. In 2015, he represented Russia in the UEFA U-19 European Championship and finished the tournament as runners-up. He later made his international debut in a friendly against Belarus and scored his 1st goal just 16 minutes after coming on as a substitute. He also made appearances in the Euro 2016 and Confederations Cup in 2017. 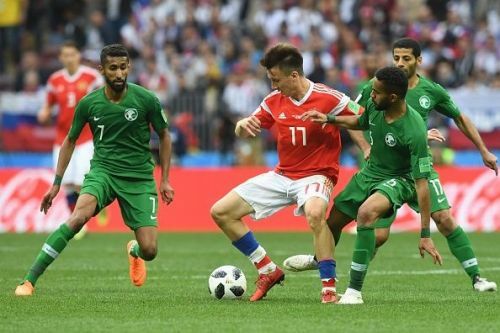 He has had a great World Cup tournament so far, playing a crucial role in Russia's opening game against Saudi Arabia, assisting 2 goals and got on the scoresheet thanks to a brilliantly taken freekick. An attacking midfielder, who can also play on either side of the wing or in a deeper midfield position, the Russian is unafraid to take on defenders. He also has great dribbling skills, which is one of his main assets. He also contributes defensively and hence can also play in a deeper midfield position, but that won't be necessary at Chelsea. Holding on the ball, playing long shots or making short key passes, is Golovin thrives on. In the most recent season, the player made 43 appearances for his club, in all competitions, scoring 7 goals and assisting another 6. Of course, as a 22-year-old, the player still has got places to improve. Winning ariel duels and crossing is something which he should work on. Again, he should not be judged just on this World Cup performances, as that does not always work out at the end. Just ask any Spurs fan and they would back this statement with the example of Moussa Sissoko. The player had a good tournament in the Euro 2016 but struggled to establish himself in the side. Adapting is the key. Golovin might have a good run in the World Cup, he would still have to adapt to the Premier League's physicality, and how can one forget the English Media who are ever ready to slam a player, be it as little as a tattoo. But then again, Sarri had wanted to sign him up previously and work with him. So considering he is Sarri's signing, there shouldn't be a problem with adapting. Having said that, Sarri still needs to be announced as a Chelsea manager first though. This saga has dragged way too long but it is believed that it is a matter of when and not if Sarri will be a Chelsea manager.